Starting in 2003, the federal government has made available 50 MHz of new radio spectrum between 4.940 MHz and 4.990 MHz for public-safety use. This spectrum is designated for fixed and mobile broadband wireless services. Communications in this band must support the protection of life, health or property, with proposed uses including wireless local area networks, or WLANs; mobile data; video security; voice over IP, or VoIP; and ad hoc networks. Although permanent point-to-point fixed installations are allowed with certain restrictions, the main purpose of the band is for temporary point-to-point links and mobile operations, which take priority over permanent fixed installations. 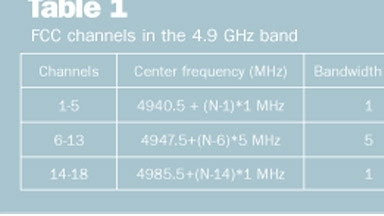 This article provides a basic primer for navigating the 4.9 GHz airwaves. Prior to 2003, the 4.9 GHz band (4.940 GHz to 4.990 GHz) in the U.S. was allocated to federal government fixed and mobile services. The band was used for fixed services such as conventional point-to-point microwave, tactical radio relay, high-power tropospheric scatter systems, and for mobile services such as control of remote piloted vehicles, video and data telemetry links, target drone control links, fleet defense systems and tethered aerostat systems. In 1999, the 4.9 GHz band was transferred from federal government use to non-government use in accordance with the provisions of the Omnibus Budget Reconciliation Act. In 2000, the FCC released a Notice of Proposed Rulemaking that suggested allocating the 4.9 GHz band to non-government fixed and mobile services, excluding aeronautical mobile service, on a co-primary basis, and allowing for flexible use of the band. The FCC also tentatively decided not to designate the band exclusively for public-safety use. However, many local government entities and national public-safety associations argued that public safety urgently needed this spectrum for broadband wireless services. In its second Report and Order (R&O), the commission reversed itself and reserved the 4.9 GHz band exclusively for public safety . The FCC issued a third R&O in May 2003 that defined additional rules for eligibility and use of the 4.9 GHz band, and for the first time allowed public-safety agencies to apply for and receive licenses to operate in the band . FCC rules governing the 4.9 GHz band are found in Part 90, Title 47 of the Code of Federal Regulations . Sections of Part 90 relevant to the 4.9 GHz band include the following: Part 90.523 defines who is eligible to hold a 4.9 GHz license; Part 90.1213 defines the channelization of the band; Part 90.1215 defines the power limits for radios operating in the band; and Part 90.210 defines the emission masks for the band. The FCC allows channels to be aggregated to channel bandwidths of 1, 5, 10, 15, or 20 MHz. The maximum channel size is 20 MHz. FCC channels are listed in Table 1. An emission mask defines how much spectrum the signal may occupy. Today, the FCC authorizes two masks for use in the 4.9 GHz band: Emission mask L for low-power devices and emission mask M for high-power devices. The M mask provides better adjacent channel protection and was adopted first. The L mask is nearly identical to the mask defined in the IEEE 802.11 standards. It was chosen to let public-safety agencies and equipment vendors exploit the economies of scale created by existing 5 GHz commercial off-the-shelf devices, thereby reducing costs and time to market. Both emission masks are plotted for 10 MHz in Figure 1 on the proceeding page. Higher-power devices will of course extend the range and reliability of 4.9 GHz networks, so from that perspective, emission mask M is preferred. Emission mask, transmitter power and effective isotropic radiated power (EIRP) are tightly coupled in the FCC rules. Part 90.1215 creates a relatively complicated set of power limitations that we will summarize here. Part 90.1215 limits both transmitter power and EIRP. 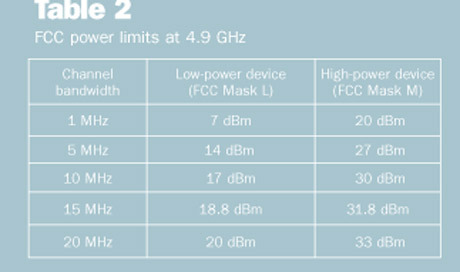 The power limits for low- and high-power devices are listed in Table 2. Note that within each category, the power density (dBm/MHz) is the same, regardless of channel bandwidth. The power-density limit for low-power devices is 7 dBm /MHz, while the power-density limit for high-power devices is 20 dBm/MHz. EIRP is the product of transmitter power and antenna gain (relative to isotropic radiated power). Assuming that the receiving station is operating in the main lobe of the transmitting antenna, EIRP determines the power received, not the transmitter power. For example, a 30 dBm transmitter operating with a 10 dBi antenna has an EIRP of 40 dBm, but a 27 dBm transmitter operating with a 13 dBi antenna also has an EIRP of 40 dBm — both systems will result in the same receive power if the receiving station is in the main lobe of the transmitting antenna. Both low- and high-power devices may use omnidirectional or directional antennas with gains up to 9 dBi at maximum transmitter power. Low-power devices may use directional antennas with gain greater than 9 dBi if both transmitter power and power spectral density are reduced decibel-for-decibel by the amount the directional antenna gain exceeds 9 dBi. High-power devices used for point-to-point or point-to-multipoint operation (fixed or temporary) may use directional antennas with gain up to 26 dBi at maximum authorized power. However, directional antenna gain may exceed 26 dBi if both transmitter power and power spectral density are reduced decibel-for-decibel by the amount the directional antenna gain exceeds 26 dBi. 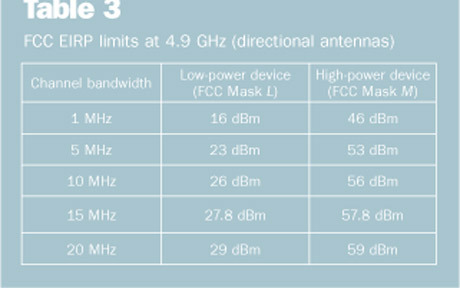 EIRP limits for directional antenna systems are summarized in Table 3. The emission mask was a contentious issue in 2003 and 2004. Emission mask M — also known as the “tight” mask — originally was the sole emission mask authorized. But neither IEEE 802.11a or 802.11j radios could meet this emission mask, so there was no industry-standard 4.9 MHz product available to public-safety agencies. Consequently, the National Public Safety Telecommunications Council (NPSTC) and other agencies filed comments with the FCC objecting to the original emissions mask on the grounds it would preclude the use of industry-standard 802.11 radios and would result in expensive, proprietary devices that would stifle innovation. 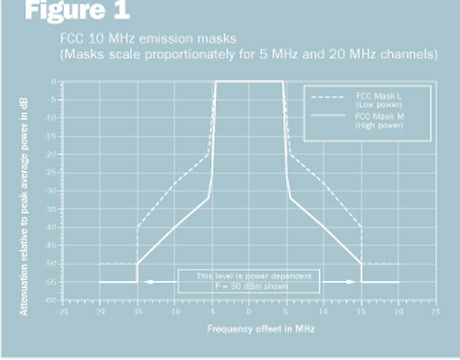 The FCC relented and eventually adopted two masks for 4.9 GHz, the original M mask for high-power devices and the L mask for low-power devices, in November 2004 . Thus, the prohibition on the 802.11a mask has been lifted, but the power limitations of the “loose” L mask create an incentive to use tight mask devices. At the time of this writing, some manufacturers are developing or have fielded devices that are 802.11 standard-compliant and meet the tight mask, so the original problem may soon be overcome. Second Report and Order and Further Notice of Proposed Rule Making, “In the Matter of the 4.9 GHz Band Transferred from Federal Government Use,” WT Docket 00-32, Adopted February 14, 2002. Memorandum Opinion and Order & Third Report and Order, “In the Matter of the 4.9 GHz Band Transferred from Federal Government Use,” WT Docket 00-32, Adopted April 23, 2003. Title 47 of the U.S. Code of Federal Regulations, Part 15, Part 90, October 1, 2005. Much of the content for this article was originally developed for the Colorado 4.9 GHz Project, an NTIA-funded study under the direction of the Parker Fire Protection District (Daniel Qualman, Chief).